Whisky Ladies “Trans Tasman Tour” to New Zealand & Tasmania with a nod to Crazy Uncles! The Whisky Ladies adventures continue… this time waaaaay down under with drams from Tasmania and New Zealand. Often with our Whisky Ladies sessions, there is a particular bottle which “anchors” an idea and we build a theme around it. In this case, over two years ago our host picked up from Australia Whippersnapper’s Crazy Uncle Moonshine. 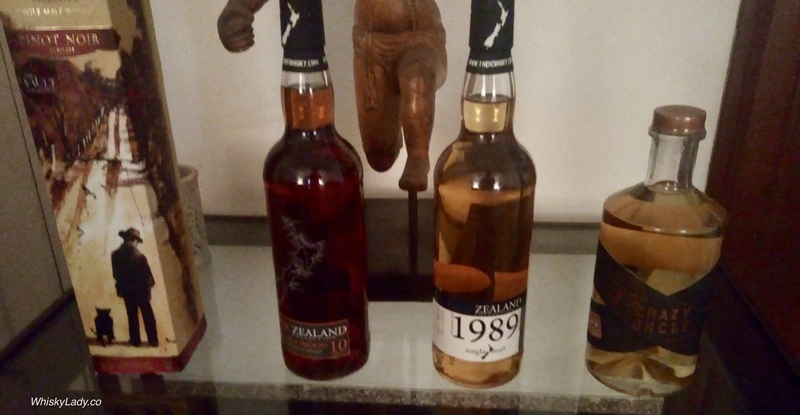 She then stumbled across in the UK a pair of New Zealand whiskies from a closed distillery… and thus a Kiwi plus Australian dram discovery in Mumbai theme was born! And while we technically had 3 bottles, our core focus is whisky, so when we learned another Whisky Lady had been hanging on to a celebrated Sullivans Cove from Tasmania, it naturally had to join the mix! And I had a “back-up” Hellyers Road Pinot Noire…. just in case it was needed…which proved be handy as traffic conditions on that particular evening were atrocious! So what specifically made it into our “Trans Tasman Tour” explorations? Bowmore 1989 “BBQ Mango Salsa” 46% (Wymess) too! It was indeed a memorable malty evening of fabulous fellowship over a different dram or two or three or four or more! This entry was posted in Australia, Beyond Scotland, Islay, New Zealand, Scotland and tagged Crazy Uncle Moonshine, Hellyers Road, New Zealand Co, Sullivans Cove, Whipersnapper, Willowbank by Carissa Hickling. Bookmark the permalink.